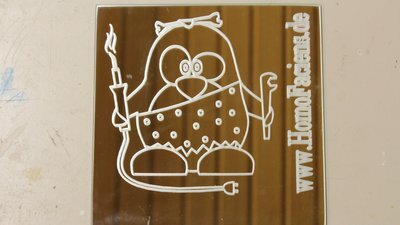 Michael has made a copy of CNC v2.1 and you can find his instruction with additional tips and tricks on his maker page (German, but Google translate helps). Leave a comment or send me a mail if you have made videos of your replicas, too - thanks! There were many requests about using my CNC version 2.0 with bipolar stepper motors, which is why I have done that conversion. You can find the parts list for the mechanics in the chapter about CNC v2.0. A4988 driver boards 4 For currents up to 2A @ 35V with heat sink! You can see similar systems at old steam engines. 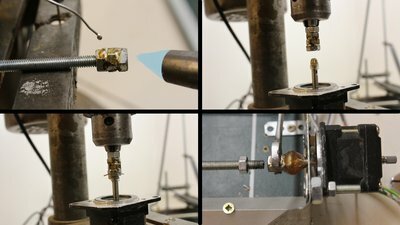 A piece of brass tube is used as oil reservoir and a 1mm drill hole forwards the oil to the threaded rod. Use oil with a high viscosity and fill in just a few drops or else it will start dripping. Christian left a comment that there is some cotton wool inside the brass tubes of old steam engines to avoid dripping. Thanks for that hint! I have drilled out the 6mm threads inside 10mm bolts. After that I have inserted a piece of a 6mm threaded bar and used 2 nuts to tighten that thread slightly so that you can still turn the rod easily by hand. 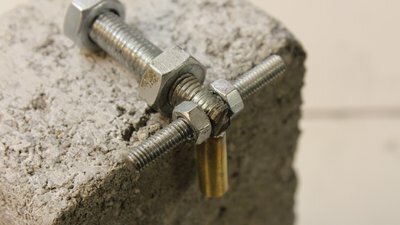 The nuts are fixed on the bolt using hotglue. Epoxy is stronger, but you can make corrections more easily with hotglue if the thread is jamming or if there is still too much backlash. The linkage between 5mm motor shaft and 6mm threaded rod is composed of three 6mm nuts that are soldered. 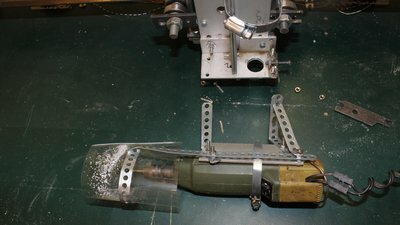 With a 1.5mm drill hole and the slotted motor shaft, a piece of 1mm wire can be used to connect the adapter with the motor reliably. You can align the adapter upright with a drill press when gluing the screws with the motor shaft. 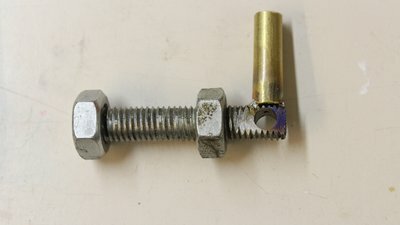 After connecting the threaded rod with the motor shaft, nut number four is used to lock the linkage. Those low tech adapter isn't perfectly centered. The rod as well as the motor wobbles noticeably. If you can do it better or if you spend some more money for a quality part, you will get a higher precision. Once more I wanted to use simple tools and easy to get materials for the upgrade of my CNC machine. The mount of the stepper motor is made of thin metal sheets to avoid the construction from jamming. The router is attached with some perforated metal stripes when engraving glas. 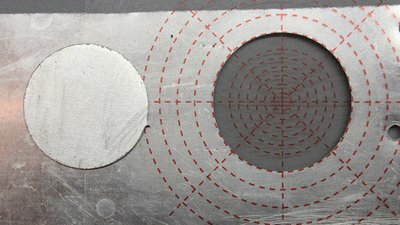 Same as before, the router is mounted on an aluminum angle using a metal ring, but now there is an additional fastening point at the bottom of the motor. Thats where commercially available brackets normally link the router with the mechanics - once more I am using the low tech version. A "skirt" made of perforated metal stripes and a stripe of a plastic bag keeps the coolant or dust in place and your machine clean. Thanks to Luciano for that hint. 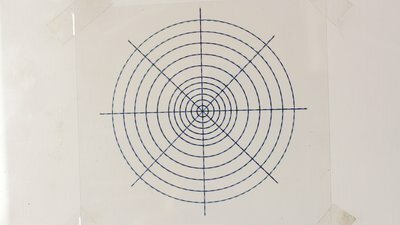 Test pattern, plotted with a ball pen. 0.8mm Aluminum. Metal work wasn't part of the specification for this machine and the aluminum brings the mechanics to it's limits! To get the maximum speed with those motors they are usually driven with constant current instead of constant voltage. 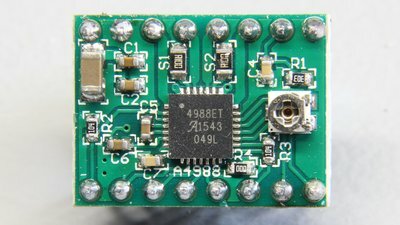 I am using boards with A4988 chips which are cheap and can switch currents of up to 2A at up to 35V. In order to connect the stepper motor to the driver board you need to know which pair of cables belongs to each phase. 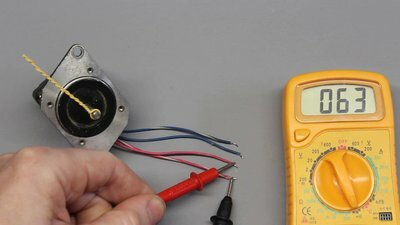 Switch your multimeter to continuity measurement to find those pairs. At this type, the red and the blue colored pairs are internally connected to a phase. Phase 1 is connected to pin 1A and 1B, phase 2 runs to pin 2A and 2B. It doesn't matter what phase is connected with what pair of output terminals. Ground is connected to ground of the Arduino and also joined with ground of the voltage source of the motors. The voltage supply for the logic levels, sometimes marked with Vdd has to be connected to +5V of the Arduino. The supply voltage of the stepper motors must be in the range between 12 and 35V. 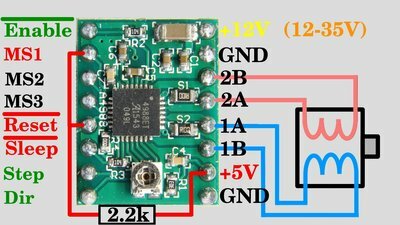 I am using the 12V line of an old computer power supply. "Not reset" must be on HIGH level to activate the chip which is done by an external 2.2 kiloohms pull-up resistor (use a resistor between 1k and 10k). "Not enable" must be on LOW level. The board has an internal pull-down resistor, thus that pin is on LOW level by default. Nonetheless this pin is connected to a pin of the Arduino so that the motors can be disabled by software. "Not sleep" must be on HIGH level to activate the chip which is the default value caused by the internal pull-up resistor on the board. "Direction" and "Step" are connected to the microcontroller. MS1 to MS3 are used to adjust microstepping and all of those terminals have an internal pull-down resistor, thus they are on LOW level by default which means the motors are driven in full step mode. I am driving the motors with half steps, thus MS1 must be on HIGH level. The phase current is adjusted by a tiny potentiometer. Dial the maximum current range of your multimeter - which is 10A at this type and switch it in series to a phase. I have adjusted all boards to 700mA which generates a torque that is sufficient to move all axes with ease. Furthermore that current is far from the limit values of the stepper motors as well as the driver boards, giving you a high reliability of the system. 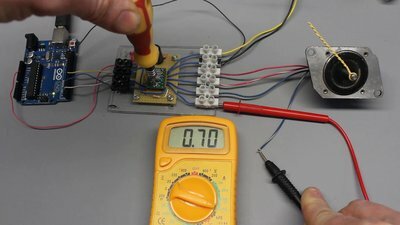 Never disconnect or connect the stepper motor from the driver board while the circuit is powered (as I did in the video)!!! 1.) Turn off power supply. 2.) Switch the multimeter in series to a phase. 3.) Turn on power supply and adjust the current to the desired value. 4.) Turn off power supply and reconnect the stepper motor to the driver board. The software used to control the machine is written in C and it is running from the command line. With the menu you can choose the test pattern and set some variables. 1.) 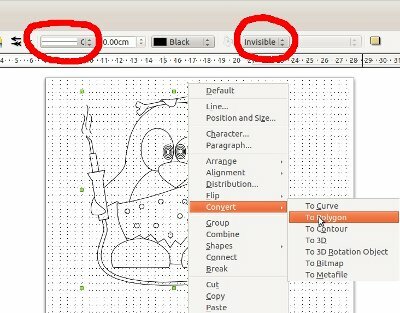 Draw graphics witth LibreOffice Draw. 2.) Press Strg + 'A' to mark all objects. 3.) Click on "Modify -> Convert -> To Polygon". 4.) Set line attributes to "Continuous" and to black color. 5.) Set Filling to "Invisible". 7.) 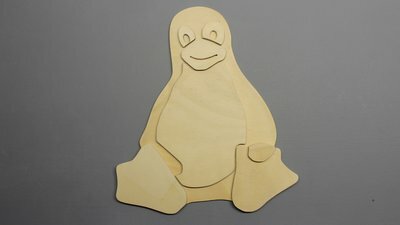 Copy the file to the subdirectory "pictures" in the installation folder of the CNC software. You can get the source code with some example vector files in the Download section. With GRBL you can process G-code. I don't answer questions that are not related to this installation procedure of GRBL. Anything else can be found in the GRBL documentaion!. Click on "Sketch -> Import Library -> Add Library". Select the "grbl" folder inside the "grbl-master" folder and click "OK". After successful import you can find the software in the dropdown menue "File -> Examples -> grbl -> grblUpload". Click on Upload and wait until the process has ended successfully. Be sure the Arduino is connected to USB. With my stepper motors and 6mm threaded rods I get 200 steps per mm and the maximum speed is 120mm/minute. Open the terminal window of the Arduino IDE and set a baud rate of 115200baud and line ending to "Carriage return". you can list all machine parameters. Close the Arduino terminal window and the Arduino IDE. You can find the example file "gnome-G-code.nc" in the subdirectory "pictures" of my software. How to create G-code using CAD software is your problem. 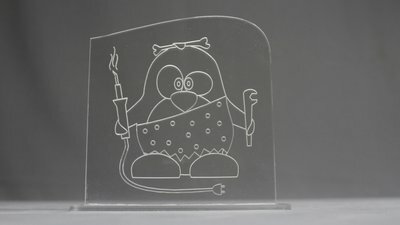 I (currently) don't use any CAD programs! 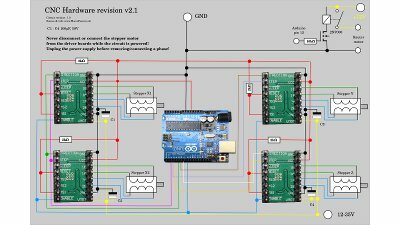 Question: How can I upload the Arduino sketch? Now, the Arduino sketch (*.ino) of the download package should open in the IDE automatically if you click on the *.ino file (in Ubuntu 14.04LTS it does). That IDE sometimes also opens the file "commands-CNC.c" in another tab of the window. Close that tab before compilling the software! In the dropdown menue click on "File -> Upload" to compile and upload the sketch. Question: How can I check if all motors are running correctly? Answer: After starting "commands-CNC", you can control the motors with the cursor keys. Cursor left/right moves the motors of the X axis for one step. 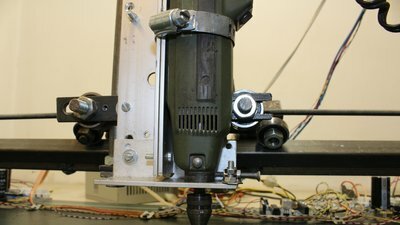 Cursor up/down moves the motor of the Y axis for one step. 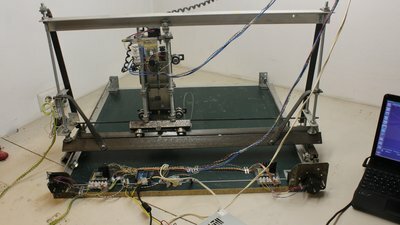 Page up/down moves the motor of the Z axis for one step. You can select a larger number of steps per key press with the 'm' key (from 1 to 1000). Question: The two motors of the X axis spin in different directions. Answer: Change the direction of rotation of one motor by swapping the cables of one Phase running from the A4988 board to the stepper motor. Question: The plot is mirror inverted. Answer: You must change the direction of movement along that axis. To do so you have to swap the cables of one Phase running from the A4988 boarde to the stepper motor. If the plot is mirror inverted along the X axis, you must change the direction of movement for both motors. Question: How can I install the software? Answer: Read "readme.txt" in the download package. The software runs under Linux (tested with Ubuntu 12.04LTS and 14.04LTS). Question: I get the message: "Waiting for 'X' from Arduino (Arduino pluged in?)..." when I start "commands-CNC", but nothing happens. Question: I get the message: "Waiting for 'X' from Arduino (Arduino pluged in?)..." when I start "commands-CNC", even after adding my user account to the 'dialout' group. 1.) Disconnect your Arduino from the USB port. Now, all connected devices are listed (it's usually a long list). 3.) Connect your Arduino to the USB port. again. Now there should appear one more device. That's the name of your Arduino. Find that additional device in the list. If the name is "/dev/ttyACM0", there is nothing to be done. If the name is "/dev/ttyUSB0", you have to adapt the source code. 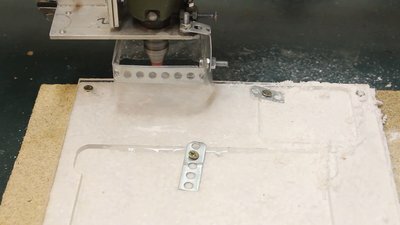 Question: How can I stop the machine quickly in case something goes wrong? Answer: There is a tiny push button on the Arduino board. That switch resets the microcontroller, thus all motors should stop immediately. After that you can quit "commands-CNC" by pressing 'Esc' or 'Ctrl + C'. If your power supply has a power button, you can stop the machine by cutting off the supply line. As soon as you turn the power on again, the machine continues working. You can also stop the running process by pressing the 'Esc' key. The machine stops, lifts the router and drives back to the point of origin. Question: I still have an unanswered question! Answer: If your machine doesn't operate as expected, send a mail to info@HomoFaciens.de including an EXACT description of what goes wrong! Things like "the LED is lighted up" (what LED?!?) or "nothing happens" are totally useless to me! There is always something happening and if you get messages from a program, they are meant to be read!!! Furthermore you should describe what you have tried to solve that problem. Making a photo or a short video and attaching it to the mail is a good idea since I don't stand next to you and can't see what happens. Don't write a novel, but I expect more than four or five sentences! A good question is half the answer and the quicker I can determine your problem, the quicker I can go back to my work on this project! Use the comment functionality only for very small problems or suggests for improvements. There is no need to type your mail address in the comment section! If you expect to get an answer by mail, you have to send me a mail first.